When it comes to international cuisines, you'd be hard pressed to find anything more vegetarian-friendly than Italian. With menus dominated by pizza and pasta, there are generally plenty of meat-free options to choose from. Fortunately for us, Melbourne is packed with excellent Italian eateries from the cheap and cheerful to upmarket restaurants we'll reserve for special occasions. Having dined on melt-in-your-mouth gnocchi, deconstructed lasagnas and mock Bolognese, we're well qualified to bring you the ultimate guide to some of the best vegetarian pastas dishes in Melbourne. Bon appetite! The folk at Sauced Pasta Bar sure know their pasta. So much, in fact, that you could eat there for weeks on end and enjoy a different dish every time. Customers can choose from more than a dozen different sauces – including veg-friendly options like green pea and lemon, The Four Ps (pumpkin puree, pine nuts, Persian feta and basil pesto) and the classic napolitana – matched with a similar number of types of pasta. We recommend the zucchini fettuccini and the field mushroom and ricotta ravioli. Having a dinner party or just want to impress your parents? Take Me Home pasta could be just the ticket. 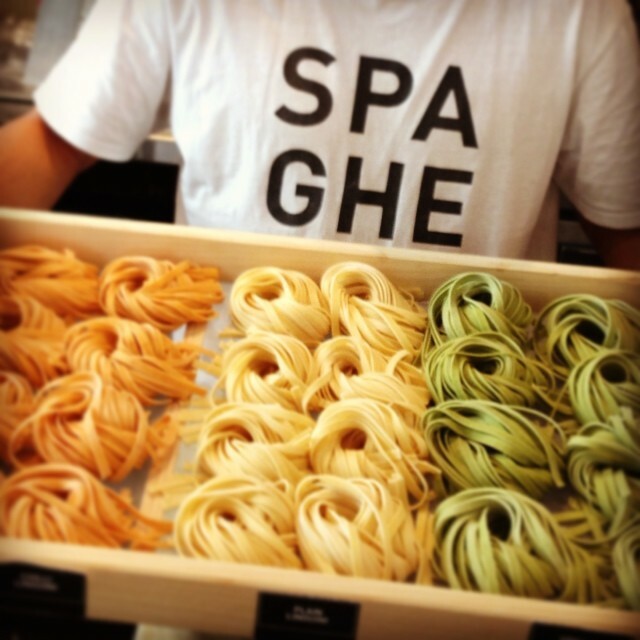 The Melbourne-based company specialises in restaurant-quality homemade pasta, available in 500g packages and able to be cooked in minutes. As well as a couple of vegetarian lasagnas, there's a range of gnocchi including the mouthwatering nettle and ricotta, beetroot and sweet potato and black pepper. The gnocchi is available exclusively at farmers markets or Take Me Home's Coburg kitchen. As the second oldest pub in Melbourne, Collingwood's Grace Darling Hotel has a rich history. The latest incarnation of the bluestone building includes two band rooms, a restaurant and a cozy front bar. It's also home to one of the best menus around town, with classic pub grub dishes proudly crafted from sustainable and local produce. Vegetarians can't go past the eggplant and goats cheese lasagna, served with a fennel salad. It's creamy, cheesy and downright delicious. Part restaurant, part pizzeria, part delicatessen, part café and bar – South Yarra's Italian Chef is whatever you want it to be. The Chef's thin crust pizza is up there with Melbourne's best, but we can't go past its famous gnocchi tricolore. Forget your standard tiny potato parcels – this coloured gnocchi is made from beetroot, spinach and ricotta. It's perfectly accompanied by San Marzano Napoli sauce, basil and buffalo mozzarella – and so good you'll want to return for seconds. What's lasagna when it's not a lasagna? The answer can be found at Brunswick Street's Yong Green Food where the 'rawsagne' remains one of the signature dishes. Part of the restaurant's raw food menu (which includes a vegan Hawaiian pizza and a kelp pad Thai), this deconstruction of a classic lasagna includes layers of zucchini with mushroom, avocado, cashew cream and raw walnut Bolognese. Gluten free, organic and vegan, it ticks all the boxes for a guilt-free dinner. You don't need us to tell you that Guy Grossi's Grossi Florentino has been one of the best Italian restaurants in Melbourne for longer than any of us can remember. The main restaurant is great for special occasions, while the Cellar Bar next door provides some of the best value for money meals anywhere in the city. There are always a few vegetarian homemade pasta dishes on the menu, from the classic gnocchi Napoli to tortellini de Zucca (pumpkin and sage). Make sure you leave room for dessert – they're to die for. Want to know how seriously South Melbourne's Etto takes its pasta? How about the fact that it started a Pasta Appreciation Society (no jokes), complete with membership cards and special offers? It's all about Italian street food, with a casual menu of pizza and pasta. Vegetarians can match the roasted vegetable caponata (zucchini, red capsicum and eggplant in Roma tomato Napoli sauce) with more than 10 pasta varieties on offer, including mushroom, leek and garlic ravioli, or potato and corn penne. Hidden in the backstreets of Coburg, Little Deer Tracks is a welcome oddity – an all-vegetarian Italian café. In addition to a variety of burgers, salads and incredible carrot, corn and haloumi fritters, there's always a handful of meat-free pasta dishes to choose from. The spaghetti with slow cooked lentil ragu is a winner, while the soft handmade gnocchi is served with a sensational Creamy Red Hill blue cheese sauce and topped with rocket and walnuts. If you're after a gorgeous backdrop to your meal, St Kilda's Sapore can't be beaten with its panoramic views across Catani Gardens and the beach. Good thing for us, the bustling Italian bistro has plenty more to offer than its prime location. The winter menu has plenty for your meat-eating dining companion (including steaks and seafood) and a couple of the best vegetarian pasta dishes around. The pick of the bunch of the melt-in-your-mouth pumpkin risotto, with gorgonzola, sage and beurre noisette. Since opening in 2012, Mont Albert's Cantina Centrale has become one of the most popular and reliable Italian eateries in the eastern suburbs. The split-level restaurant specialises in thin crust woodfire pizza and house-made pasta dishes. There's a twist on the classic gnocchi with a ricotta incarnation, and just as appetising, a ricotta and mixed mushroom ravioli served with truffle cream and parmigiano. In a sea of Italian restaurants on Lygon Street, Tiamo has remained head and shoulders among the pack for more than three decades. Reliable and affordable, it's little wonder the restaurant (and its sister eatery Tiamo 2 next door) is packed seven nights a week. The traditional Napoli sauce here is as authentic as anything you'll find this side of Italy, and comes served with your choice of fettuccini, penne or spaghetti (as well as meaty choices, if you're that way inclined). Sometimes, after a long day in the office, the last thing you want to do when you get home is cook. That's where vege2go comes in. The Brunswick store sells and delivers gourmet vegetarian meals across town – perfect for stocking in the fridge or freezer at home or work. Vegetarian pasta options include lasagna, spinach and mushroom risotto, spinach and ricotta cannelloni and a spelt pasta Bolognese. The latter, with its mock meat Bolognese, will fool even your carnivore pals. Editor's note: Keen to discover some alternative vegetarian options in Melbourne? Here's a link to our round-up of Melbourne's 11 best restaurants for vegetarians (many of which do vegan options too!). If it's more Italian ideas you're looking for, check out our story on the best Italian restaurants in Melbourne.